What would you do if a cow barked like a dog? If a bird stole your mail? If a honeybee grew to the size of a house? What??? is a book of many possibilities. It presents humorous questions in rhyme and inspires children to answer creatively. Each page offers a new opportunity to solve problems, predict outcomes, create narratives, and think critically. 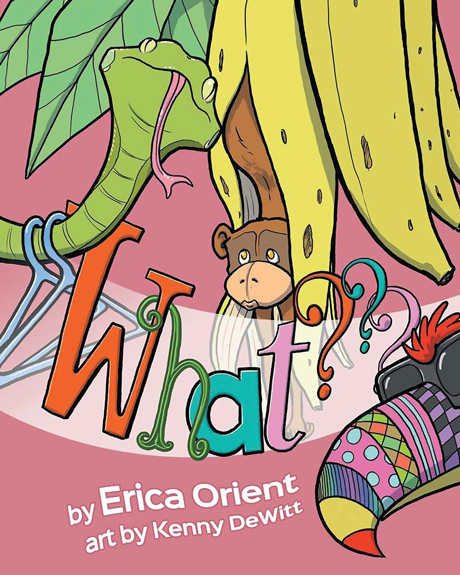 Adults and kids alike will enjoy the colorful illustrations and adorable animal characters in clever “what if?” situations. With enough fun to explore over and over again, What??? will help inspire a lifelong passion for reading. Erica Orient began her career as an occupational therapist before opening a toy store, drawing upon her knowledge in hope of helping children with their physical and cognitive growth. As a mother of four, she strives to see her children grow every day in their love of reading, writing, and imagination. This book is for them, and for all children everywhere.